Shivaraatri is celebrated as the night when the Lord manifested Himself in the form of the Lingam and showed the entire universe that He is without beginning and without end. This has been related in the katha (story) taken from the Shiva Puraana where Lord Brahma and Lord Vishnu were engaged in a long battle over who was the most important God. It was during this battle that a column of fire appeared in the middle of the battlefield. When Brahma and Vishnu saw this, they were astonished as they could not see the beginning nor the end of this column of fire which was splendid at sight. They decided to have a contest. How so ever was able to find either the beginning or the end of this column of fire would be crowned as the great god. Lord Vishnu took the form of a boar and proceeded down the column of fire but failed to find its end. However, Lord Brahma took the form of a swan and proceeded upwards and also failed to find the beginning. Brahma saw a Ketaki flower falling and caught it. He asked Ketaki where he was coming from. The reply was that Ketaki was coming from the middle of the column of fire. Lord Brahma threatened Kataki to destroy him if he did not agree to be a witness and tell Lord Vishnu that he found the top of the column of fire. Ketaki agreed in fear of his life. As Lord Brahma was relating to Vishnu that he found the beginning of the column of fire and that he also had a witness, the column of fire turned into a ball of fire. It was from this ball of fire that the Jyotir Lingam appeared. Then Lord Shiva appeared from the ball of fire. It was then that Lord Brahma and Lord Vishnu realized that it was Lord Shiva who was the Great God. Hence the name Mahadev. Maha means great and Deva means God. 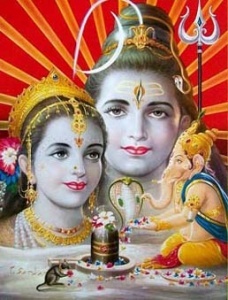 Shivaraatri begins at sunset on the evening of 13th day to sunrise of the 14th day of the dark half of the Hindi month of Phalguna which corresponds to February/March of the English calendar. I bow before that Lingam, which is the eternal Shiva, Which is worshipped by Brahma, Vishnu and other Devas, which is pure and resplendent, and which destroys sorrows of birth.